Do Land Hermit Crabs Make Good Pets? Hermit crabs are not "true crabs." They have a smaller, soft abdomen which they protect by living in an empty snail shell. They must find larger shells as they grow, and owners of these pets must provide progressively larger shells as their pets grow. In the wild they are omnivores, feeding on both plant and animal material. There are both marine and land hermit crabs, and the information here refers to the land hermit crab. 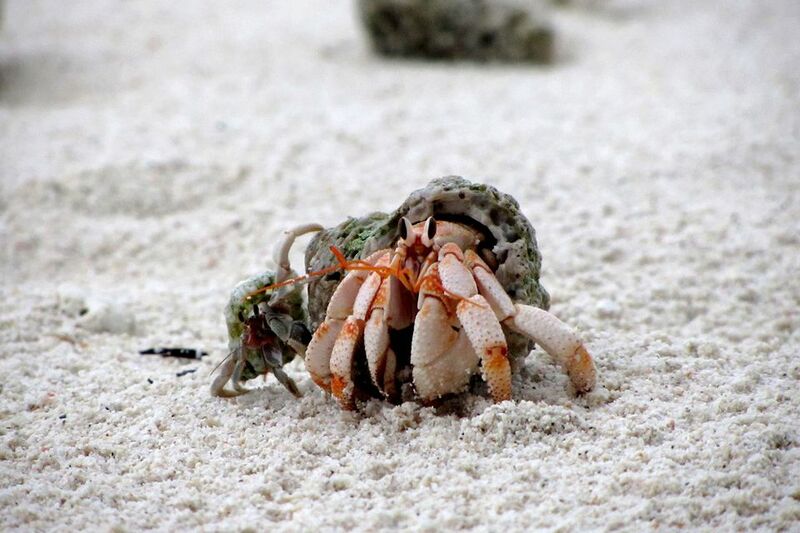 In the United States, there are two main species of hermit crabs found as pets: Coenobita clypeatus and Coenobita compressus (Ecuadorian Crab or E-Crab). Other species are also kept as pets in other parts of the world, such as the Australian land hermit crab (Coenobita variabilis), and the strawberry land hermit crab (Coenobita perlatus). Land hermit crabs are relatively easy to find in pet stores, but care is required in choosing a potential pet. Check to make sure that all the legs are present (3 pairs of walking legs), the shell covering the head and thorax isn't damaged, there are no parasites/small bugs present, and that the crab is lively. Larger crabs may be hardier, and if you already have a crab then it is important to match sizes pretty closely otherwise fighting may occur. Hermit-Crabs.com - A very thorough site about the care of land hermit crabs. Crab Street Journal - Collaborative online magazine all about hermit crabs with a strong community component. The Crabbage Patch Store - Excellent selection of hermit crab supplies (especially nice shells at great prices). Florida Marine Research - Supplier of crabs and accessories. The site has care information and tips too. Pet Discounters.com - Good source of hermit crab supplies.